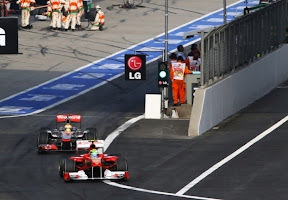 For the first time in my life, I'm actually really happy McLaren won the 2011 Chinese Grand Prix which took place at the Shanghai International Circuit this morning. The Red Bull dominance has been broken after three races, and it may finally lead to some more interesting racing as the European leg of the F1 circus starts in three weeks time. I've never been a big Red Bull fan, nor am I a fan of Vettel. Webber, on the other hand, I can respect. Early on in his F1 career, he drove for Minardi, the last minnows of the 90's/2000's era, but he was able to stick Stoddard's car on pole in Australia. That was something. There's no denying Red Bull Racing is a game changer. That part has been quite clear for some time now. I'm just not so convinced with the way they go about it. Team boss Horner just doesn't do it for me when I see him on TV. He has an annoying sense of arrogance which drives me mad every time BBC interviews him, I.e. every single race. Vettel started off well and humble, but he's also caught this arrogance bug. And between the two of them, they shunted Webber way into the back of the garage. Not very impressive, especially as Horner keeps harping about fair play and no favouritism. Rubbish! Necessities, the race was hugely entertaining. The Pirelli tyres are still holding on to their exciting entry into the sport as the most exciting thing since the Bridgestone vs. Michelin days. The drivers kept on track most of the time except when Perez decided to crash and bang into everything during the second half of the race. Let's see how it goes as we enter into the regular European part of the season. More on a personal note, I really don't feel like waking up this early anymore for a while! Well done to McLaren, and also to Mercedes for a strong result too.